Each year $3 billion of the United States economy depends on pollination from native pollinators such as wild bees. A recent study proves the fear that wild bees are disappearing, which could lead to decreased U.S. crop production. A University of Vermont study of wild bees indicated a mismatch between a diminishing supply of bees and a rising demand on crop pollination. The study estimates that wild bee abundance declined in 23% of the contiguous United States from 2008 to 2013. Commercial honeybee keepers and pollination services have faced increased demand, so wild bees are even more important. Nearly 40% of the croplands in the country depend on pollinators. Globally 66% of the most important crops either benefit from or require pollinators, including coffee, cacao, and many fruits and vegetables. The University of Vermont study’s map above identifies 139 counties in critical regions for agriculture: California’s Central Valley, the Pacific Northwest, the corn belt of the Midwest and Great Plains, west Texas, and the Mississippi River valley. 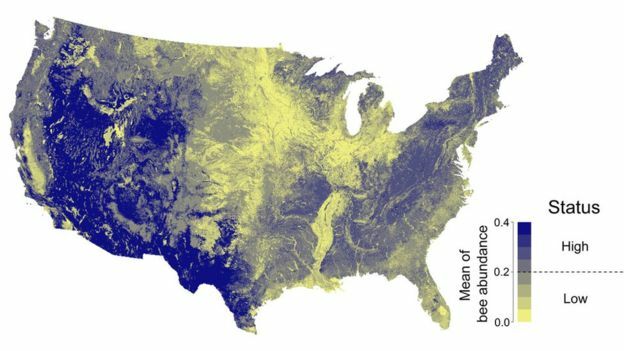 Even less pollinator-dependent crops like soybeans and cotton are grown in large quantities in these areas. The most pollinator-dependent crops are threatened in these areas—pumpkins, peaches, apples, blueberries, watermelons, plums, and almonds. The BBC map of bee abundance was created by combining a number of databases with expert opinion. 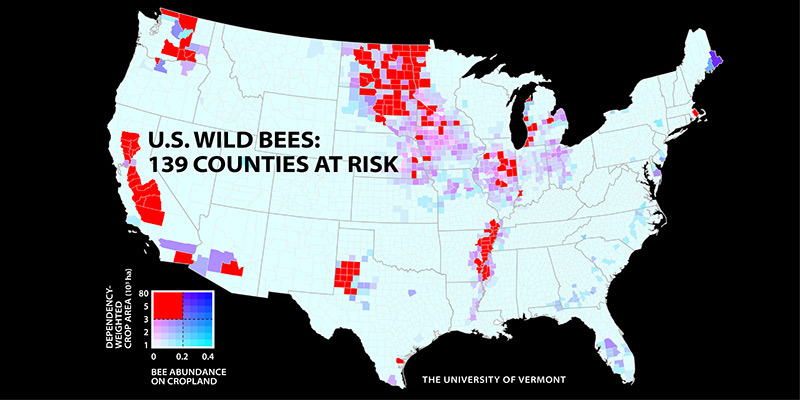 The map shows bee abundance in 2013 with a darker blue color. Conservation of bee habitats is the best solution, including incentives for farmers to grow more pollinator-dependent crops and decreased production of crops produced for biofuels. The U.S. Fish and Wildlife Service encourages Americans everywhere to plant pollinator gardens of wildflowers, even in window boxes in urban environments. Companies that are consumers of bee-related products are also getting involved with the conservation of wild bees. Burt’s Bees is a popular lip balm and beauty products company. The founder was actually a beekeeper. The company has supported pollinator health through research, education, conservation, and grants and supports of community projects. In 2016, the company launched the “Bring Back the Bees” campaign, which created more than 10,000 acres of healthy honeybee forage. General Mills, maker of Honey Nut Cheerios, exceeded its goal of giving away 100 million seeds this year. 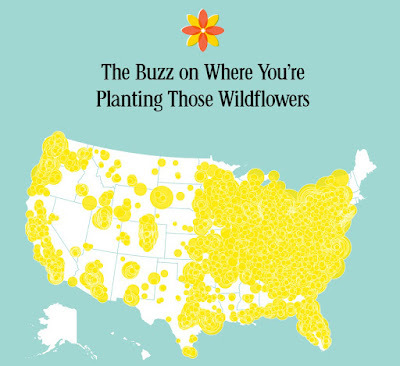 The company gave away 1.5 billion wildflower seeds through a successful social media “Bring Back the Bees” campaign. 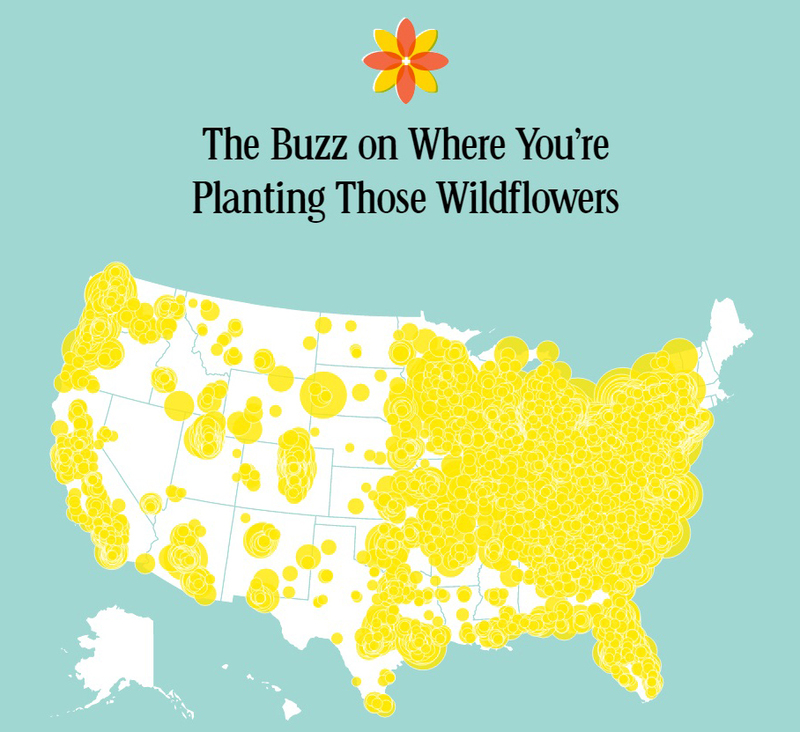 The map above shows the locations of customers receiving the seeds.